Armatec supplies all fibreglass lip extraction hoods for Challenge Cook drums. These provide good capture of odourous hydrogen sulphide, without restricting access to the drums for loading and unloading animal hides. Tannery in Wiri, Auckland was causing odour problems with neighbours. 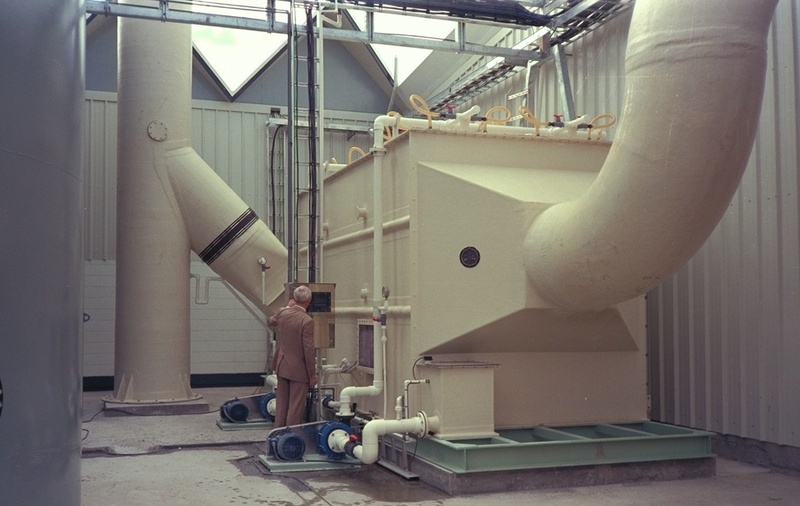 Gases were extracted from Challenge Cook tanning drums and treated in this crossflow scrubber. Armatec also supplied ducting, fan, stack and chemical dosing equipment. The two stage scrubber was designed to minimise chemical consumption. See paper written. Air extracted from tanning drums and hydrogen sulphide gas scrubbed with caustic; liquid then sent to onsite sulphide treatment. All fibreglass installation handles the very corrosive liquors and gases. Tanks were needed for the safe storage of highly corrosive >25% Hydrofluoric Acid after manufacturing. Fibreglass Tanks designed and manufactured to meet the most stringent standards. Safety rails & FRP grating at the top of the tank for built-in, long-term access & health & safety considerations. The clients have been very happy with the tanks' service and ease of maintenance. 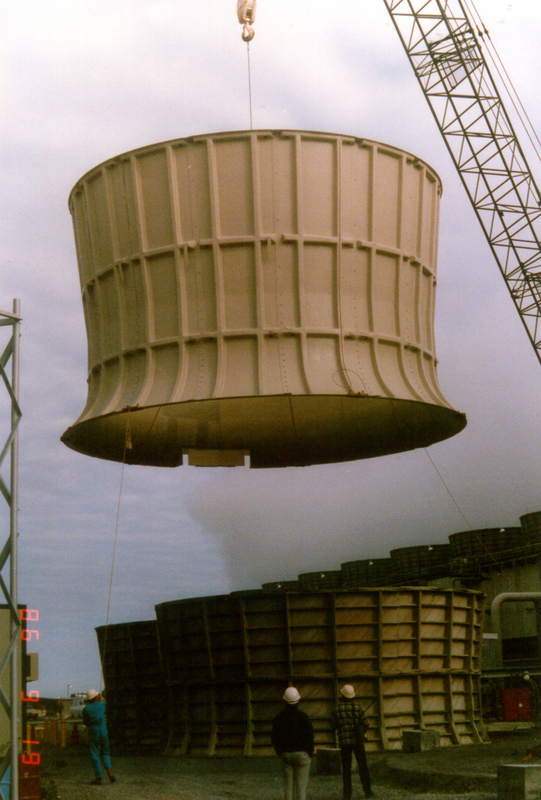 A petrochemical plant has wooden fanstacks that was supplied by original cooling tower vendor. These were inadequate in size, shape and efficiency. Armatec designed and manufactured high efficiency fanstacks in fibreglass to replace the existing setup. They were assembled on the ground at site, and craned into position in order to minimise plant downtime. The smooth internal surface gave much improved aerodynamics and improved the overall cooling tower efficiency. The fertiliser company needed to improve the working conditions within its manufacturing building, by extracting air laden with both dust and fluoride fumes. At the same time they wanted to have just one stack discharging to atmosphere, and the discharge from this had to meet their Resource Consent limits. Armatec designed, manufactured, and installed a hygiene scrubbing system including a wet cyclone scrubber, fan, ducting, and stack. This was done as part of the overall upgrade of the plant’s scrubbing system, with the hygiene system linking into the main scrubber stack. Fluoride and dust levels in the manufacturing building were much reduced, improving working conditions for plant personnel, at the same time meeting all Resource Consent limits. 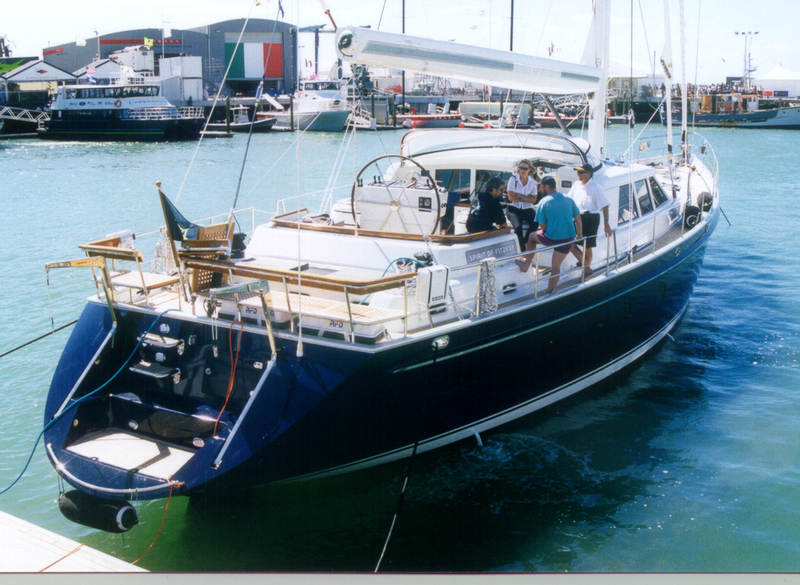 Below are a small selection of yachts and boats with Whispapipe and Marine Wet Exhaust tubing & fittings installed over the course of 15 years. 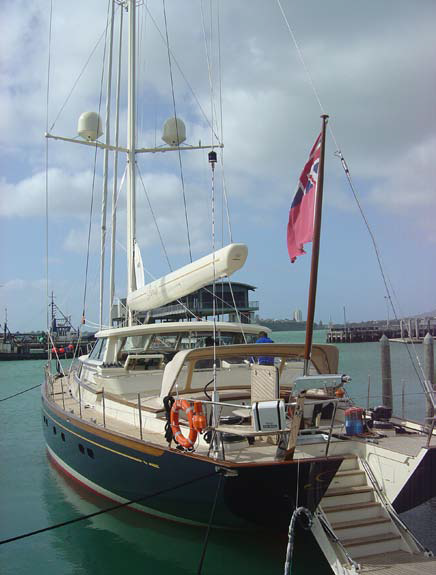 Spirit of Fitzroy with FRP exhaust system by ARMATEC. A galvanising plant had fine metal particulate and gaseous acid coming out of its plant that impeded on its neighbours, leaving a fine blanket of metal dust in the area. The budget was limited and the solution needed to be innovative to match the company's expectations and resource consent limits. Acid vapour concentrations were also causing corrosion concerns to the factory materials. 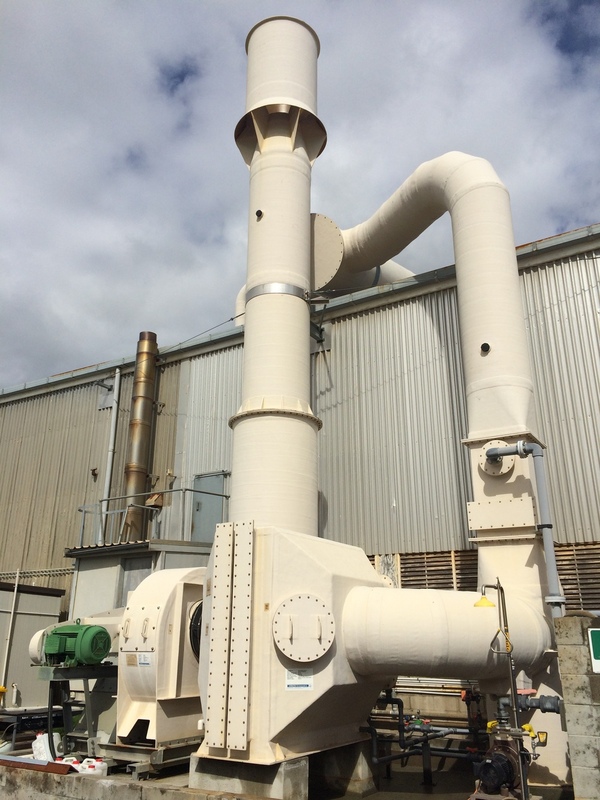 Armatec worked with the company to create an affordable hygiene ventilation and particulate capture and acid recovery system for the plant. We utilised re-purposed Armatec equipment from a decommissioned plant, installing a custom ducting design, combined with a multi-throat venturi, sump, mist eliminator and stack combination. The plant enjoyed a much improved internal working environment. 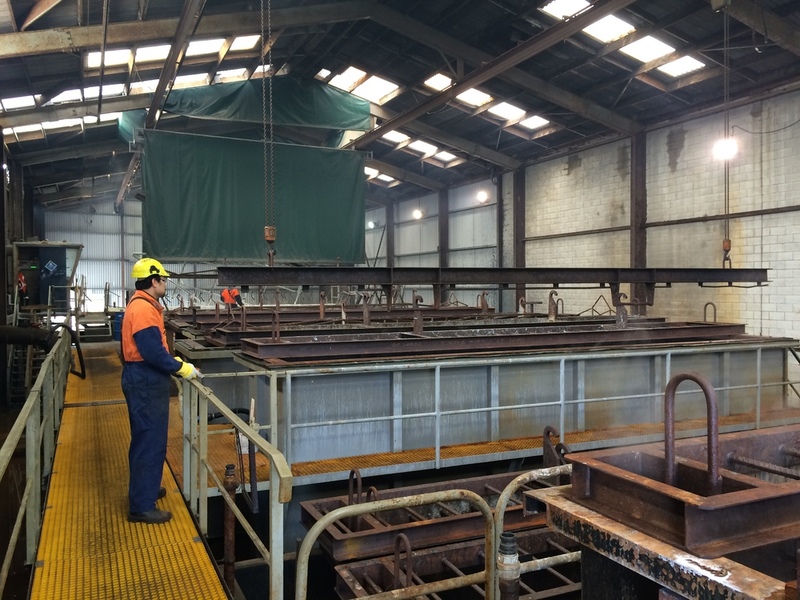 The resource consent limits were achieved and maintenance requirements from corrosion on the plant factory materials have reduced significantly. All was achieved at a limited budget and on time. Napier City Council's concrete milliscreen plant was in need of repair. The concrete had been badly eaten away by hydrogen sulphide gas - more than 20mm in places. Additionally the timeframe to was extremely tight to minimise shutdown, required a 15 year warranty and the lining application had to be curable underwater in case of emergency overflows during applications. 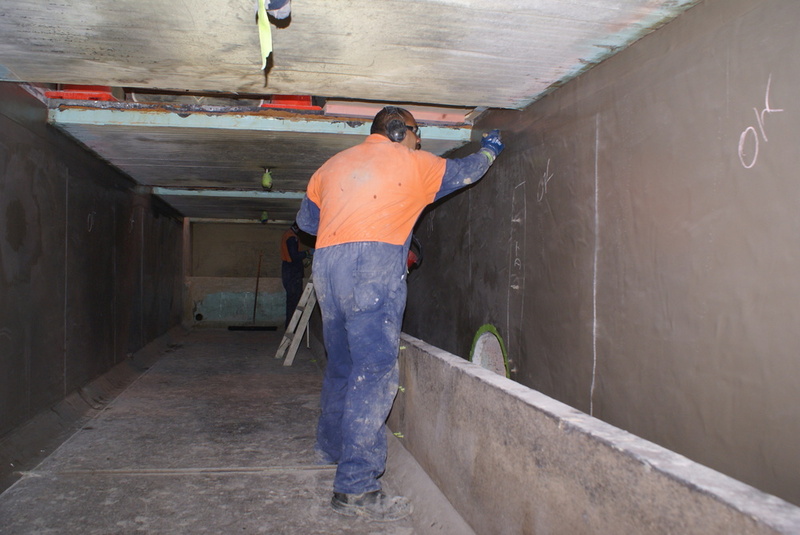 We rehabilitated the concrete structures underneath their milliscreen plant that screens all of the sewage from Napier before being sent out to sea. This is the first part of a project that will include the building of a new wastewater treatment plant. Without being able to inspect the job fully beforehand and in difficult conditions and to a tight timetable, our team finished on time and to a high quality finish. Inspections a year later showed very little signs of wear, and very few minor points for touchup. Twice-yearly inspections will continue through the 15 year warranty period. An existing sewer manhole was suffering from major corrosion issues both to the concrete and also the iron step rungs. The contractors (City Care) undertaking the repairs wanted to minimise disruption to traffic and patronage to the sports bar next to it. Excavation and replacement of the manhole was considered and discarded for the following reasons. Manhole was 1050NB and 6m deep. Manhole was located approximately 3m from the edge of the road effectively in the left wheel track. Manhole was directly in front of a sports bar with regular clientele. Excavation to the depth of the manhole would require road closures and affect the footpath and entrance to the bar. Major resealing of the road would be required. The solution was for us to make a 910NB fibreglass sleeve complete with fibreglass ladder attached. Traffic management was put in place to allow for partial closure of the road so the existing manhole top could be removed (approximately a 2m square cut in the road surface). City Care removed the iron step rungs. The fibreglass sleeve was lowered into the manhole and an epoxy grout used to seal around the bottom edge. Once a few small pipe connections were made through the fibreglass, the annulus was filled with a concrete slurry. The underside of a new concrete top was coated with our Armaline epoxy coating before being installed. City Care then reinstated the road surface. The manhole was repaired with minimal traffic disruption and without the requirement for the sports bar to close or lose business during the works. In fact, the patrons of the bar sat and watched out the front window with interest. City Care and the New Plymouth District Council were very pleased with the ease of the repair and the finished product. 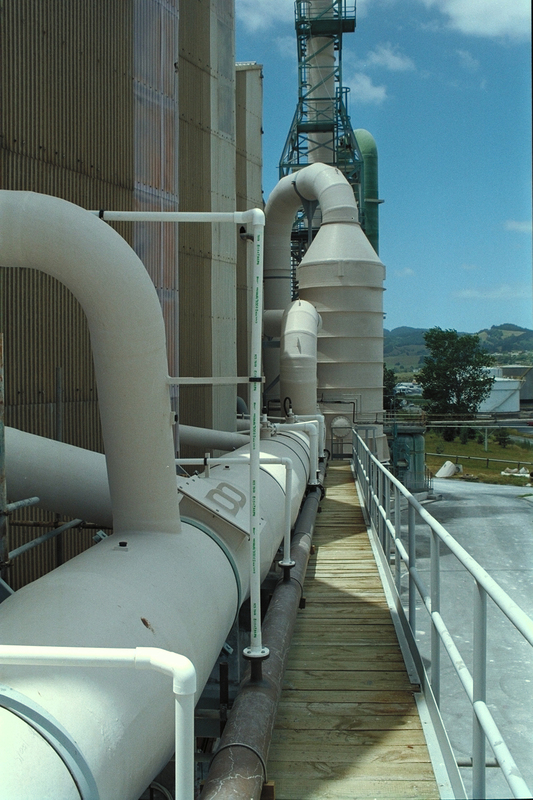 The Mangawhai wastewater sewer network is a combination of pressure sewers and a gravity network. The main pump station at Mangawhai Village is located just 10 metres from a gift shop. There were odour complaints from this pump station as soon as it originally started operation. The pump station handles inflows from both gravity sewers and pressure sewers, and pumps directly to the main Mangawhai wastewater pump station, near the wastewater treatment plant. The area is mainly a holiday destination, with its population increasing dramatically in summer months. To solve the challenge, the operators required the following key requirements for an odour filter be met: that it had minimum maintenance, low operating costs and low visual impact. 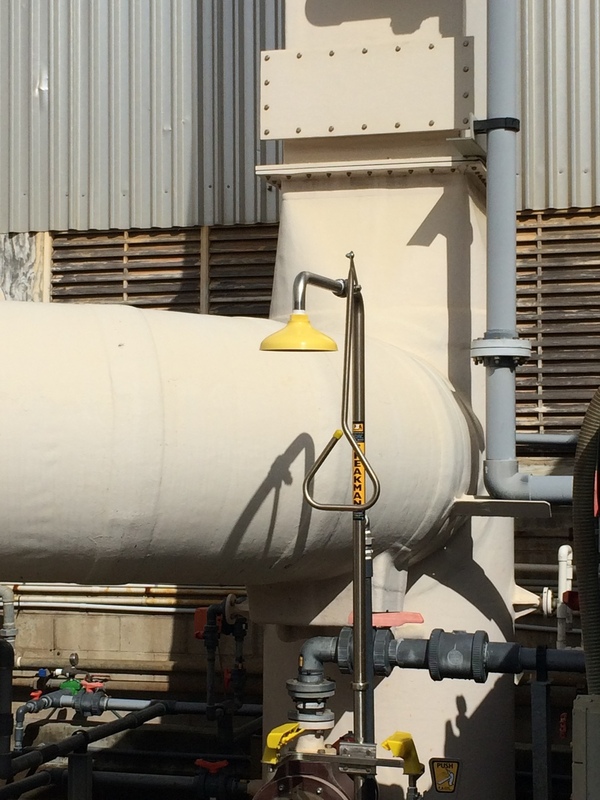 Armatec installed a GDOF-24 Green Dome Odour Filter connected directly to the pump station with an underground duct, treating the air as it is physically displaced from the pump station when the water level rises. A larger GDOF was installed on a second pump station in close-by area in Mangawhai. The Green Domes were installed partly underground, with the ducting from the pump station totally underground, minimising visual impact. A domed lid covering the top of the carbon bed is all that is visible. Constructed in corrosion resistant fibreglass, all parts are designed to have a very low pressure drop, ensuring as much air as possible exits the pump station via the carbon bed. The outcome has been wonderful for the shops, neighbours and visitors - with all odour issues removed. The gift shop attendant noted: "The odour was gone as soon as it was installed. There is no odour whatsoever, in comparison to how it was. It is just fantastic. It was a horrible smell. It made the working environment really hard to work in. Customers would always comment on it." Following the first two successful Green Domes at Mangawhai in 2010, over 50 Green Domes have now been installed throughout New Zealand and Australia eliminating odours released from pump stations, air release valves and manholes. 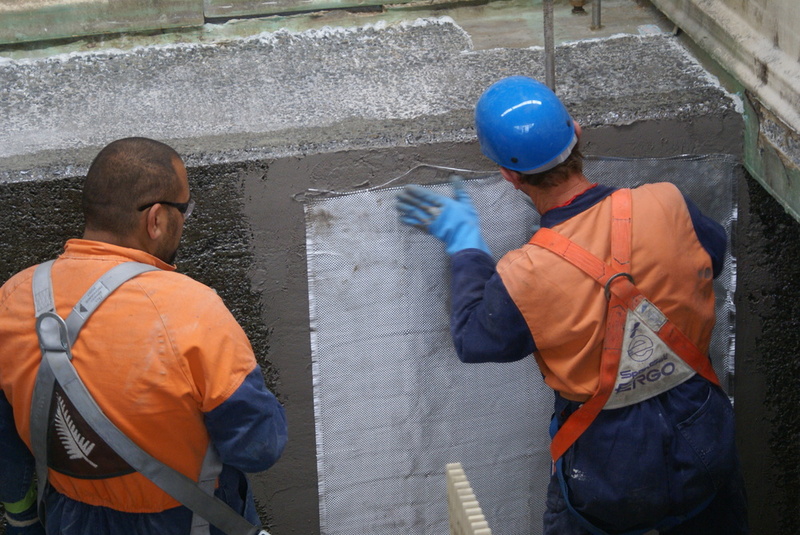 A flow metering flume was required for a new prison complex in Auckland. The flume had to be installed in difficult soil conditions in a short timeframe. In order to be accurate, flumes must be built to strict dimensional tolerances. Achieving this in a below-ground installation using traditional methods can be difficult and time consuming, especially when the soil is loose volcanic scoria. In addition, personnel access to the flume is generally required for monitoring and maintenance. Armatec¹s fibreglass flumes are built using precise moulds so every flume produced is dimensionally accurate. The flume can be incorporated into a fibreglass manhole to provide the access needed. This is all done off-site at Armatec¹s factory, minimising site works. These features meant that the contractor was able to excavate the hole, install the flume, connect the pipes, place concrete around the flume, and backfill in just a single day. This saved both time and money on the project, and helped to avoid delays due to inclement weather. A cost-effective and well-constructed flume installation that allowed accurate metering of wastewater flows. Valve chambers are required to be installed underground alongside pump stations in earthquake liquefaction zones in Christchurch. They protect the valve equipment yet provide access for servicing. Earthquakes largely destroyed the wastewater network of Christchurch, and these valve chambers were an integral part of the re-build. The flanged underground valve chamber was designed to withstand the large liquefaction loads imposed by the devastating shallow earthquakes. The valve chambers are anchored to both an underground concrete slab and the fibreglass pump station, restricting differential movement in the event of an earthquake. To date installations have withstood dozens of smaller aftershocks without damage. A new concrete manhole was installed on a long residence sewer from Whangarei Heads back to the treatment plant. However the concrete was severely corroded in less than one year due to hydrogen sulphide gas attack. The contractor was issued with a notice to rectify and achieve a design life of 50 years. The sewer was already live and could not be taken out of service for more than a few hours at a time using plugs and turning off stream pump stations off, using the storage capacity of the network only. Armatec supplied a FRP Liner to lower into the manhole and form a new manhole surface inside the existing one. The top of the manhole was removed, the liner fitted, and then the cavity between the FRP Liner and the old manhole was grouted. This was all done during daytime hours with the sewers plugged. At night time the plugs were removed and the sewer flowed as per normal, minimising disruption and costs. The manhole now has an all fibreglass inside surface that is totally impervious to hydrogen sulphide attack. The expected life of the manhole is now in excess of 50 years.